StarBurn 15.5 was available as a giveaway on December 1, 2016! 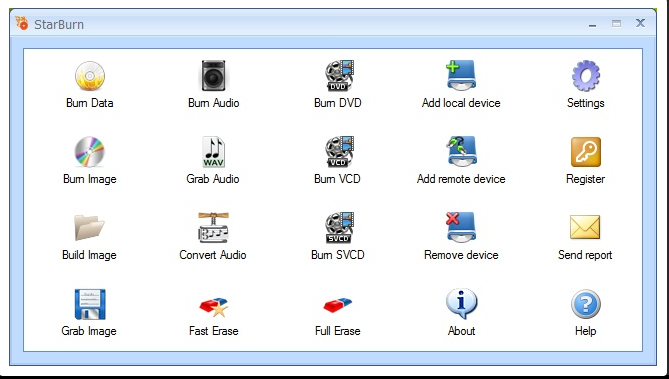 StarBurn is a powerful tool that allows its users to grab, burn and master CD, DVD, Blu-Ray and HD-DVD. The program supports all types of optical storage media (including CD-R/RW, DVD-R/RW, DVD+R/RW, BD-R/RE, HD-DVD-R/RW and DVD-RAM) and a wide variety of burning hardware. How would you improve StarBurn 15.5? GOTD SHOULD PLEASE STOP PLAYING ON OUR INTELLIGENCE! GOTD SHOULD PLEASE STOP PLAYING ON OUR INTELLIGENCE! We need some transparency. I still have Starburn 12 from an old giveaway it no longer loads or runs... 15.5 installs alongside 12 happily if given unique install and start menu folders... of course it didn't fix the broken Starburn 12 install... As usual this is not DVD or BD or videocd authoring software, that has to be done with some other program, this is a collection of wizards that use the starburn SDK, it comes licensed to Free User and on manually entering the string supplied in the readme.txt file the licensed user is changed to "Give Away of the DAY Network" It is annoying that it keeps the Starburn.exe running as an icon in the systray notification area and I cannot seem to bring up a context menu to force it to exit and have to resort to task manager and end task on it manually when I want it to stop wasting resources when no longer needed. TK, ah in settings wizard Common TAB there is an option "Minimize Starburn on close" that if unchecked makes it exit on close and not hide it in the systray notification area. One can also choose "Old School" view to revert to the old layout over the new selection of wizard icons. You may also want to set the update check frequency to "Never" check. NOTE there is a bug in the GUI for the update check settings the Old School Settings MENU has an Update Checking fly out menu and that does NOT match/follow the Settings\Settings wizard Update Checking TAB setting. changing either one does not have any effect on the other. One can only hope one of them works as intended! Once the program is installed, the Start Menu for the program also has a link to the Local help file, and a link to the online Help (url). Regardless of there being a local help (chm) file, any time a Help button is clicked, the program opens a browser window to the online version. There does not seem to be a way in the settings to change the behavior to use the local help file instead. to the one on offer for free at the website. I already have it installed and registered for 'free use'. This registration came with the program that is at the website. As a test, I used the GOTD Registration Code and now my free version is registered to GOTD. The program on offer is identical - Name: StarBurnSetup.exe CRC-32: 3983f004 MD4: 7911df60dedf708f96008d80446104f8 MD5: f06794376b325fc1b75b36204828db1f SHA-1: 02db0b1e55068e0b2b97515b5a00426f6e36a572 to the one on offer for free at the website. I already have it installed and registered for 'free use'. This registration came with the program that is at the website. As a test, I used the GOTD Registration Code and now my free version is registered to GOTD. Hello Ant, That is the strange thing. As far as I can see because I haven't investigated all the features of the program, it doesn't do anything except change the name of the registration. It seems that the only difference between the free and the GOTD version is who the registration is attributed to. Hello Ant, That is the strange thing. As far as I can see because I haven't investigated all the features of the program, it doesn't do anything except change the name of the registration. It seems that the only difference between the free and the GOTD version is who the registration is attributed to. Does this remove region codes? Work with all regions? First Shut Down your computer to power off. Then reboot. Don't open any other program or browser. Then Shut Down to power off. To those having problems installing it, this is a high quality program and it is worth working with it a bit. If you have installed it and have a problem: First Shut Down your computer to power off. Then reboot. Don't open any other program or browser. Then (re)install this. Then Shut Down to power off. Then reboot. Then give it a try. Starburn has always been a great program. It has a missing feature. The only thing I need to do right now is rip this CD. I want to rip it to 96kbps MONO because it is a mono CD recorded in 1956. There is no choice for mono/stereo. And for stereo I want to choose joint stereo or regular stereo. You could easily add that in, but it hasn't been there for 10 years so I am not holding my breath. I rip things to 96k mono or stereo for my cheapy MP3 player, and 320k mono or Joint Stereo for the good stuff. There's not enough choice here. Otherwise, great program in every other way. Starburn has always been a great program. It has a missing feature. The only thing I need to do right now is rip this CD. I want to rip it to 96kbps MONO because it is a mono CD recorded in 1956. There is no choice for mono/stereo. And for stereo I want to choose joint stereo or regular stereo. You could easily add that in, but it hasn't been there for 10 years so I am not holding my breath. I rip things to 96k mono or stereo for my cheapy MP3 player, and 320k mono or Joint Stereo for the good stuff. There's not enough choice here. Otherwise, great program in every other way. J, CD's mono or stereo did not exist in 1956... CD-Audio does not have a MONO mode of operation. What you probably have is a stereo CD with the mono recording, recorded originally in 1956 on some other media, as two identical 44.1K samples per second 16 bit resolution channels. It would sound mono but would in fact be a normal stereo CD with no stereo information encoded into the two channels. 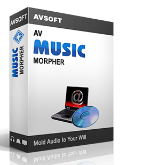 Just grab/rip to WAV file and then convert to whatever final format you like using any number of free media converter utilities. It is to be expected that the grabbing wizards process treats ALL grabbed data as stereo since CD format is ONLY a stereo format there is no such thing as a MONO CD. J, CD's mono or stereo did not exist in 1956... CD-Audio does not have a MONO mode of operation. What you probably have is a stereo CD with the mono recording, recorded originally in 1956 on some other media, as two identical 44.1K samples per second 16 bit resolution channels. It would sound mono but would in fact be a normal stereo CD with no stereo information encoded into the two channels. Just grab/rip to WAV file and then convert to whatever final format you like using any number of free media converter utilities. It is to be expected that the grabbing wizards process treats ALL grabbed data as stereo since CD format is ONLY a stereo format there is no such thing as a MONO CD. What is StarWindLite that came bundled with StarBurn? Tried to find info. about it, not found any where. What is StarWindLite that came bundled with StarBurn? Tried to find info. about it, not found any where. >What is StarWindLite that came bundled with StarBurn? Look at the list of supported systems and you will notice there are Server OSes listed as well as the common computers/workstation OSes. Imagine you have multiple computers/workstations all connected to one server, but none of the workstations have a DVD burner, ... but the server does. You need a way of connecting the workstation to the DVD burner on the server. The solution is an iSCSI Initiator, of which StarWindLite is. You can install StarWindLite on the server, and install StarBurn on a workstation, and then be able to burn your DVD on the server. The StarWindLite is a service that runs on the computer that has the burner (if it is different from the computer that has the StarBurn). Microsoft makes an iSCSI Initiator as well, and most servers with a DVD burner will already have the Microsoft version. StarBurn should work with the Microsoft iSCSI Initiator just fine. If however, your server does not have a DVD burner, and therefore, may not have the Microsoft iSCSI Initiator, but you want to add a DVD burner, then you could use the StarWindLite to make the connection between the two computers. By the way, the two computers do not need to be on the same network, and the burner could be at a remote location that you connect to via the Internet. So, if you do not have a DVD burner, but your friend on the other side of the world does, and you are dying to send that person a burned DVD, you could work together to get the DVD burned on their computer. Granted, it may not be fast over the Internet, but at least you wouldn't have to buy the DVD blanks. Eldad, >What is StarWindLite that came bundled with StarBurn? As I understand it ... Look at the list of supported systems and you will notice there are Server OSes listed as well as the common computers/workstation OSes. Imagine you have multiple computers/workstations all connected to one server, but none of the workstations have a DVD burner, ... but the server does. You need a way of connecting the workstation to the DVD burner on the server. The solution is an iSCSI Initiator, of which StarWindLite is. You can install StarWindLite on the server, and install StarBurn on a workstation, and then be able to burn your DVD on the server. The StarWindLite is a service that runs on the computer that has the burner (if it is different from the computer that has the StarBurn). Microsoft makes an iSCSI Initiator as well, and most servers with a DVD burner will already have the Microsoft version. StarBurn should work with the Microsoft iSCSI Initiator just fine. If however, your server does not have a DVD burner, and therefore, may not have the Microsoft iSCSI Initiator, but you want to add a DVD burner, then you could use the StarWindLite to make the connection between the two computers. By the way, the two computers do not need to be on the same network, and the burner could be at a remote location that you connect to via the Internet. So, if you do not have a DVD burner, but your friend on the other side of the world does, and you are dying to send that person a burned DVD, you could work together to get the DVD burned on their computer. Granted, it may not be fast over the Internet, but at least you wouldn't have to buy the DVD blanks. Also note on the StarBurn choices, there is an option to "Add Remote Device." That is how you would connect to the other computer that has the DVD burner. Of course, the DVD burner does not have to be on a server; it could be any other workstation as well, as long as you can connect to it via a network or the Internet (by the way, the first i in iSCSI stands for Internet). You only need to install the StarWindLite when there are two computers involved, and of course, it gets installed on the computer that has the burner only. These days, most computers, even laptops have a DVD burner. When you think about it, it was mighty nice that the developer included StarWindLite, and at no extra charge. Eldad, Also note on the StarBurn choices, there is an option to "Add Remote Device." That is how you would connect to the other computer that has the DVD burner. Of course, the DVD burner does not have to be on a server; it could be any other workstation as well, as long as you can connect to it via a network or the Internet (by the way, the first i in iSCSI stands for Internet). You only need to install the StarWindLite when there are two computers involved, and of course, it gets installed on the computer that has the burner only. These days, most computers, even laptops have a DVD burner. When you think about it, it was mighty nice that the developer included StarWindLite, and at no extra charge. Eldad, I think you'll find it is the cd/dvd/bd emulator driver/service optionally installed by the installer. Thank you all for the detailed replies. I installed StarBurn on both my XP PC and W7 laptop. The later does not have a disc drive, and I thought of trying to use it with a stand-alone USB2 DVD drive. I wonder if you or anyone tried to do that, as far as I checked - USB disk drives are not mentioned in the StarBurn Instructions or Help. Eldad, you should be able to use USB BD/DVD or CD drives as if they were SATA or PATA connected drives with any current and even not so current versions of windows with any burning software that works via established protocols. The only proviso' is that the USB interface must have sufficient bandwidth to feed the writing drive at the attempted speed i.e. you won't get a BD disk burning reliably if at all on a USB 1.1 port as 12Mbit per second total bandwidth isn't enough to feed BD x1 rate. I think that USB2 is probably fast enough to burn music or data cds, perhaps at X24. What do you think? Thank you TK. I think that USB2 is probably fast enough to burn music or data cds, perhaps at X24. What do you think? Eldad, provided the USB optical drive is connected to a hub in High-speed mode and not full-speed mode it should work fine for x24 CD writers if the media supports it and upto x8 DVD again subject to media support. Bear in mind that the 480Mbit/second USB2 high-speed mode is shared across all USB2 devices so if you have other potentially high bandwidth devices connected at the same time they could reduce the ability to service an optical drive promptly. Thank you TK, most helpful! Installed and registered on XP-PRO-SP3 without any problem, thank you very much! Installed, restarted PC, Ran software, got "A problem caused the program to stop working correctly. Windows will close the program and notify you if a solution is available." SIMPLE EASY TO USE 5 STARS. Heck, even the GOTD wrapper itself requires Win XP with SP3 and IE 8- 95 is NOT possible! I'll never unstand where GOTD team gets their requirements info from- they never match with the program author's program any more.... Says this is compatible with as low as Windows 95- not true. From StarBurn website: <i> Minimum System Requirements: Windows XP (with Service Pack 2 installed) 800 MHz Intel Pentium III class processor 512 MB of RAM 50 MB of disk space for StarBurn application data CD or DVD burner Recommended System Requirements: Windows 8.1 Dualcore CPU 2 x 1,5 GHz 4 GB of RAM 1 GB of disk space for StarBurn application data and log files Blu-Ray or HD-DVD burner </i> Heck, even the GOTD wrapper itself requires Win XP with SP3 and IE 8- 95 is NOT possible! It's not GOTD's team fault. Windows 10 are supported. Both 32-bit and 64-bit." They should probably edit that webpage. Hi Trying 2 b Helpful. :-) It's not GOTD's team fault. See <b>starburnsoftware.com/products/starburn/features</b>: "Windows 95, Windows 98, Windows Me (Millennium Edition), Windows NT, Windows 2000, Windows XP, Windows Server 2003, Windows Vista, Windows Server 2008 R2 and Windows 7, Windows 2012 R2, Windows 8, Windows Server 2016, Windows 10 are supported. Both 32-bit and 64-bit." They should probably edit that webpage. Trying 2 b Helpful, Ummm whilst what you say is true it's not completely relevant firstly what xilolee said, and secondly todays giveaway is NOT wrapped in the GAOTD wrapper therefore the XP SP3 min requirements is not imposed! 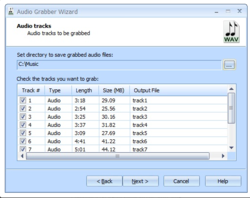 Can anyone elaborate on how this program will "grab" audio? That term means downloading it from videos, streaming sites, etc. yet I see no other mention of this in the product description. Quote: "StarBurn is a powerful tool that allows its users to grab, burn and master CD, DVD, Blu-Ray and HD-DVD." Can anyone elaborate on how this program will "grab" audio? That term means downloading it from videos, streaming sites, etc. yet I see no other mention of this in the product description. 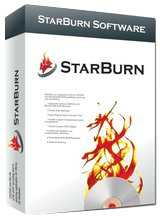 Quote: "StarBurn is a powerful tool that allows its users to grab, burn and master CD, DVD, Blu-Ray and HD-DVD." SoftwareJunkie, in this case, it means it will rip the music from your physical media. 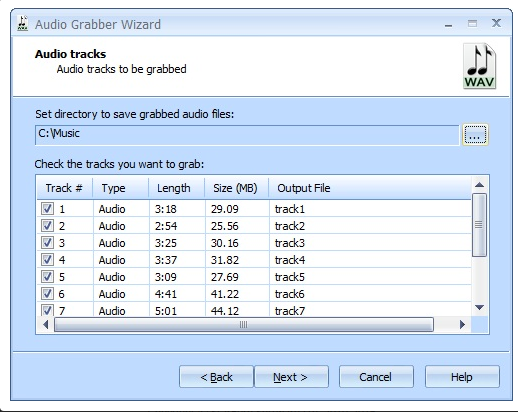 Long ago, I used a program called AudioGrabber whose entire function was just that: grabbing music from CDs. So there is a precedent for using that word in that way from long before people imagined capturing streaming media. I've been waiting for this one forever, however, I tried creating an audio CD, and about 5 songs into it, Starburn crashes. I need to buy more blank DVD's, so I wasn't able to try this. Any suggestions from the developer? I've been waiting for this one forever, however, I tried creating an audio CD, and about 5 songs into it, Starburn crashes. C:\Users\Ji\AppData\Local\CrashDumps\AudioBurner.exe.2800.dmp C:\Users\Ji\AppData\Local\CrashDumps\AudioBurner.exe.4128.dmp I need to buy more blank DVD's, so I wasn't able to try this. Any suggestions from the developer? hmmm...call me crazy but, if you've "been waiting forever for this" why not just pony up the (less than) 5 bucks this program costs and you won't have to wait at all. Seems like a reasonable idea to me. I'm almost certain that the software developers rely on sales to stay in business. .. But i could be wrong, i guess. Jim, hmmm...call me crazy but, if you've "been waiting forever for this" why not just pony up the (less than) 5 bucks this program costs and you won't have to wait at all. Seems like a reasonable idea to me. I'm almost certain that the software developers rely on sales to stay in business. .. But i could be wrong, i guess. jeff matthews, why would Jim pony up 5 bucks for a program that crashes when he tries to use it? sjbehr, how could Jim know this program crashes if he doesn't pony up 5 bucks. Michael, That is the whole point of GOTD, to try/test software before you waste your money on software that you don't need or doesn't work. This is Obviously a great tool for the software developer too. They see that their software is not working for some. So they get a chance to use us as beta testers and we get a chance to get some really great software or not as in this case. what really goes on at this site. Kerry Voss, at last someone understands the gist of what really goes on at this site. jeff matthews, First of all the expression "waiting forever" doesn't need to be taken literally. Jim just means that he is glad to see the program on offer. In second place, the StarBurn is offered as a free program and can be licensed as such with no cost at all. So nobody needs to 'pony up' anything.